There is a good deal of confusion in current media reports regarding statements from INITE party members, and an INITE communiqué reported in the press beginning yesterday, regarding the continuation of Jude Celestin’s candidacy. It seems clear that reports that the second round will include only Mirlande Manigat and Michel Martelly have jumped the gun. As noted in the press, Jude Celestin did not sign the communiqué. We are posting an unofficial translation of the full communiqué below, and the original, in kreyol, can be seen here (page 1) and here (page 2). The statement does not state that Celestin is withdrawing. 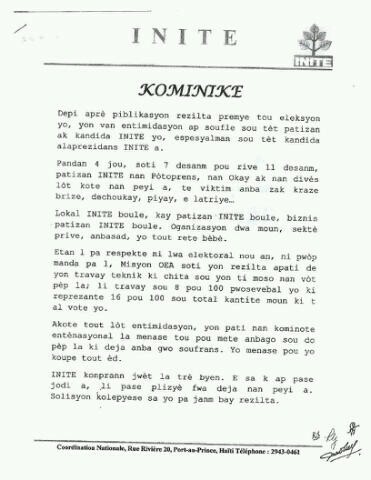 Nor does it say, as has been reported, that INITE “ is no longer supporting its presidential candidate,” rather, it is vague, suggesting that Celestin is welcome to withdraw -- but there is nothing in the communiqué itself that conveys that the party is requiring, or even pressuring him to do so. Some reports have left out any mention of the communique’s explicit references to international pressure and “intimidation”, complaints against which form the central theme of the communiqué. The communiqué makes it quite clear that the decision to “agree to see [Celestin] withdraw his candidacy for president” is a reluctant one, which the party says it makes “because INITE does not want the people’s suffering to increase even more” – a credible response to implied threats of aid cutoffs. It is perhaps notable that the U.S. is widely rumored to have revoked the visas of one of the signers, Jean Joseph Moliere, as part of a pressure campaign on the Préval government and INITE. Since the publication of the results of the first round of elections, a wave of intimidation has been unleashed against all the party leadership and candidates of INITE, especially against the INITE candidate for president. INITE offices were burned; INITE party members’ homes were burned; INITE party members’ businesses were burned. Human rights organizations, the private sector, embassies: they all remained silent. As it had no respect for our electoral law, or its official mandate, the OAS Mission published results from a technical study based on a small segment of the vote. Their study included 8 percent of the tally sheets, representing 16 percent of the total votes. On top of all of this intimidation, some in the international community threatened to heap an embargo onto the backs of the people, who are already enduring great suffering. They threatened to cut off aid. INITE knows this game well. What is happening today has happened many times in this country. These solutions are unsustainable; they will not yield long-term results. In accordance with the politics of stability that is the hallmark of the Preval presidency, and because INITE does not want the people’s suffering to increase even more, we choose not to respond to the international community’s provocations on the subject of these elections. Perhaps for this reason, even though we are certain that Jude Celestin earned the necessary number of votes to advance to the second round, INITE agrees to see him withdraw his candidacy for president. We thank Jude for his understanding of the situation, though neither he nor we are in agreement with the way things have been done. 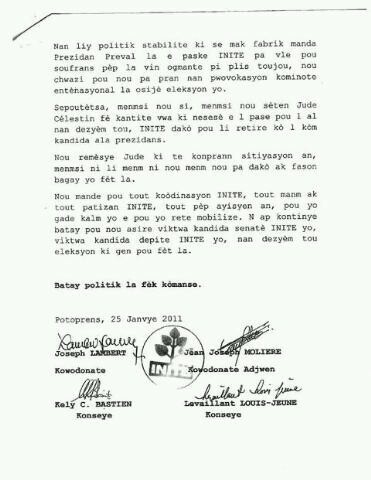 We ask all the coordinators of INITE, all the members and partisans of INITE, all the Haitian people, to stay calm and remain mobilized. We are continuing the struggle to assure the victory of the INITE candidates for senator, and victory of the INITE candidates for deputy, in the coming second round of the election. The political struggle has just begun. Depi apre pibilkasyon rezilta premye tou eleksyon yo, yon van entimidasyon ap soufflé sou tet patizan ak kandida INITE yo, espesyalmane nan tet kandida alaprezidans INITE a.
Lokal INITE boule, kay patizan INITE boule, biznis patizan INITE boule. Oganizasyon dwa moun, sekte prive, anbasad, yo tout rete bebe. Etan l pa respekete ni lwa electoral nou an, ni pwop manda pa l, Misyon OEA soti yon rezilta apati de yon travay teknik ki chite sou yon ti moso nan vot pep la. Li travay sou 8 pou 100 pwosevebal yo ki reprezante 16 pou 100 sou total kantite moun ki t al vote yo. Akote tout lot entimidasyon, yon pati nan kominote entenasyonal la menase tou pou mete anbago sou do pep la ki déjà anba gwo soufrans. Yo menase pou yo koupe tout ed. INITE konprann jwet la tre byen. E sa k ap pase jodi a, li pase plezye fwa déjà nan peyi a. Solisyon kole pye se sa yo pa janm bay rezilta. Nan liy politik stabilite ki se mak fabrik manda Prezidan Preval la e paske INITE pa vle pou soufrans pep la vin ogmante pi plis toujou, nou chwazi pou nou pa pran nan pwovokasyon kominote entenasyonal la osije eleksyon yo. Sepoutetsa, menmsi nou si, menmi nou seten Jude Celestin fe kantite vwa ki nesese e l pase pou l al nan dezyem tou, INITE dako pou li retire ko l kom kandida ala prezidans. Nou remesye Jude kit e konprann sitiasyon an, menmsi ni li menm ni nou menm nou pa dako ak fason bagay yo fet la. Nou mande pou tout koodinasyon INITE, tout manm ak tout patizan INITE, tout pep ayisyen an, pou yo gade kalm yo e pou yo rete mobilize. N ap kontinye batay pou nou asire viktwa kandida senate INITE yo, viktwa kandida depite INITE yo, nan dezyem tou eleksyon ki gen pou fet la. Batay politik la fek komanse.